We survey the economic and labour market developments of Austria in the years since enlargement to identify noticeable shifts in economic development, which can be causally linked to the enlargements of the EU in 2004 and 2007. Since the public policy debate before enlargement expressed concerns about the potential effects of enlargement on migration, the labour market position of the less skilled and foreigners as well as potentially asymmetric impacts on regions, we pay particular attention to these four aspects of economic development. We find rather ambiguous evidence. Economic development in Austria since the first round of the Eastern enlargement in 2004 has been marked by a noticeable improvement in the business cycle, which was primarily driven by higher exports to countries outside the EU 27. With the impeding financial crisis, however, Austria is likely to enter a recession in 2009 and growth expectations for 2010 are also subdued. We also find that despite strong employment growth, unemployment rates increased in the first two years after enlargement and still have not declined to levels attained at the end of the last economic upswing in the year 2000. At the same time the number of employees increased substantially since 2004. Half of this increase can be accounted for by increased migration. Increased migration in the period 2004 - 2006, however, was not primarily due to an increase in migration from the new member states, but rather due to increased migration from the old EU member states, in particular Germany. By contrast, migration from the new member states increased only modestly. Although there is some anecdotal evidence of circumvention of the existing restrictions towards immigration, actual labour movements from the NMS to Austria were small relative to ex ante forecasts of postenlargement migration potentials. This, however, was also to be expected given derogation periods on the freedom of movement of labour. 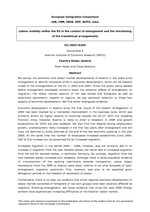 Furthermore, there is no clear cut evidence that either regional economic development or labour market outcomes of foreigners or low skill groups have been severely affected by migration following enlargement, but some evidence that since the year 2000 foreign workers have experienced increasing difficulties on the Austrian labour market.